Our company was created in April 1994 as one of the first officially registered companies engaged in LPG & CNG installation to motor vehicles. We are exclusive importer by TARTARINI, NG-CAR, TOMASETTO ACHILLE, A.E.B., VALTEK and I.M.Z. for Czech Republic. Unique machine for road repair SILKOT. LPG installation project to POLICE cars and others projects. Installation centre FIAT, RENAULT, SUZUKI, OPEL, VOLVO and many others Installer Companies. We cooperate with Ministry of transport Czech Republic, Czech Police, research institutes ÚVMV, ÚSMD and technician schools. LPG, CNG Installation. LPG, CNG service and inspection. Training of Authorised services and individual LPG & CNG installers. 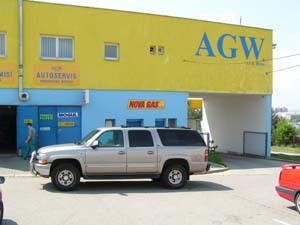 Complete car service and sale of spare parts - see e-shop.